OK, so I don't normally log in at this time of the evening. But, this one I just had to sign back in and share this idea as I thought it might be a good one, and wanted to get some input from the community (or at least from those of you who regularly participate on the Stockaholics competitions! ). Alright so getting right to it with my idea here. So, as you guys may or may not know, I help to co-run the r/StockMarket subreddit community. I'm very active on there, and put up a lot of the content that I post here on Stockaholics. Anyway, how's this for a crazy and wild idea! So, y'all know how I had recently finished test running the weekly stock picking team challenge here last week right? Basically, it was a weekly stock picking contest that was split into teams of members. Let's test run a community vs. community monthly stock picking team challenge for next month! What I mean by this is that, we could have a team of say like 10 members each (I think we can only do up to 10 people here on Stockaholics anyway since that is our maximum number of active participants we've got right now, correct?) going up against 10 members of the r/StockMarket Reddit community. Same rules and everything. I don't know about y'alls personally, but for me, I think this could not only be a very fun monthly contest go up against another group of members in a totally different community...but, this IMO could also be an opportunity to potentially bring in new members from our r/StockMarket subreddit community into Stockaholics and vice versa. I'm not sure why I hadn't ever thought of this idea sooner, but I was just chowing down some amazing pizza this evening, and this idea had just suddenly popped into my head, and thought I had to share in here with you guys before I forget all about it by tomorrow. Anyway, I just wanted to share this with you guys before signing off for the rest of the evening. I really wanted to get some input from you guys first before thinking of actually going ahead and trial running it for next month. What do y'alls think? Let me know whenever you guys can get a chance. Thanks! EDIT: And here are the form and spreadsheet links! <-- click there to submit your 2 stock picks for February! <-- click there to view the contest spreadsheet! Lico Inv, StockJock-e and Three Eyes like this. Would be pretty cool to draw some more folks into Stockaholics....it means more ideas floating around on these boards, which is a good thing! But, is this subbing for another contest, or is it an Added contest? There's already plenty. I'll play regardless (but preferably with same usual stock-picking rules- including no Penny stocks <$2). Thanks for the input fellas! Much appreciate it. So, I'll take it that we're a go for next month? I'm actually really looking forward to this one the most, since its something that I've never even imagined attempting to run until now. Not sure why I never thought of this before. But, I think this could be really fun and interesting to get interaction between our 2 communities. In fact, I'm so pumped up about this one that I've already gone ahead and setup the Google forms and sheets tonight. We could actually start running this from tomorrow if it were end of month. Can't wait until end of month to start getting members picks in from both communities. This should be really interesting. Yep, the rules will all be the same as our other contests formats. I was debating whether or not to make this community challenge 1 pick per participant or 2. I decided to keep it like our other formats at 2 picks per participant. Next week I'll have a new thread up with the Google form links and details, etc. I will also have to make a thread on r/StockMarket letting everyone there know that I'm going to do this as well. Also, since I'm capping participants at 10 per community due to the limited number of active participants on our Stockaholics side here, only the first 10 people who submit picks on r/StockMarket will be able to participate, this way we'll have the same amount of participants from both communities. Should be a lot of fun I think, can't wait to see how it goes. Alright! Well, it's official. 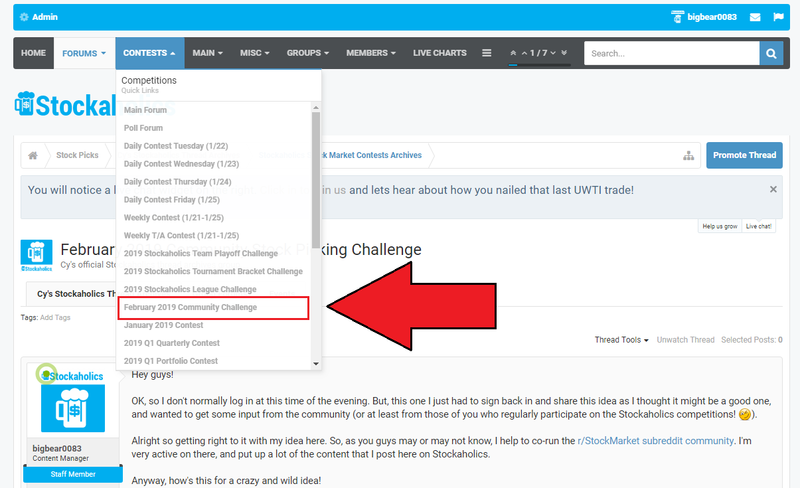 I just went ahead and renamed this thread to February 2019 Community Stock Picking Challenge, and also added this thread link into the "contests" tab drop down menu on the navigation bar at the top for easy access. Either this weekend or early next week I'll post up the Google form and the contest spreadsheet and it'll be game on! Oh man, I just thought of another idea for this community challenge. But, I wonder if we could run a 3 community challenge, and also include our Discord Live Chat community into the mix here as well? I mean I could throw up an announcement in there and let the regulars know that I'm running this community monthly stock picking challenge for next month. And, since I'm using Google Forms to automatically input members stock picks into my spreadsheet, it's very possible 10 people would submit picks on there. Personally, I'm thinking the more the merrier. My opinion is that it would make the competition even more interesting having our 3 communities battling it out. Going to be throwing up the post on r/StockMarket and our Discord Live Chat very soon. I will edit my first post here with the Google from link as well as the spreadsheet once I've got the announcements up on both of our other communities. Looking forward to getting this on for next month. Alright fellas, well I've just gone ahead and added the link for the form and spreadsheet on the bottom of the first post here. I also embedded them into the post as well. So, if you guys want to start making picks, you can do so as early as now. I hope we can get at least 10 participants on this by Feb. 1st to make this happen. Best of luck to all 3 of our communities in this first ever challenge! May the best community come out on top by month's end! This should still work fine, even if there's not the 10 members from each community. I just like there to be the same number of participants for each community if possible. So far on our r/StockMarket community we're up to 6 participants who have submitted their picks. None so far here on Stockaholics, but I suspect we're all just mostly waiting out until month's end to submit picks. I'm hoping we'll still get the 10 members from each community, but if that number turns out to be 8 or something, that'll work fine too. I've never run a 3-community stock picking challenge like this before, so I'm really interested to see how this will all work. This should be a ton of fun for all participants of our 3 communities. I see we're now up to 6 participants on each our r/StockMarket and Discord communities which is pretty encouraging to see. I think there's a good chance we'll hit that magic # 10 participants for each community before this Friday's market open. We shall see. You don’t submit the same things, right? Heh heh, it depends on whether I'm crunched for time at any given moment. I hear ya! Kinda wish month end wasn't on a Thursday. Anyway, we're now up to 7 participants on each our r/StockMarket and Discord communities. Still aiming for 10 members from each community, but if it turns out that we only get 7 or 8 that might actually work fine too. Then I would just cap the Stockaholics participation at 7 or 8 so that each community will have the same number of participants. Looking forward to getting this thing going soon!